But back to that morning . . . 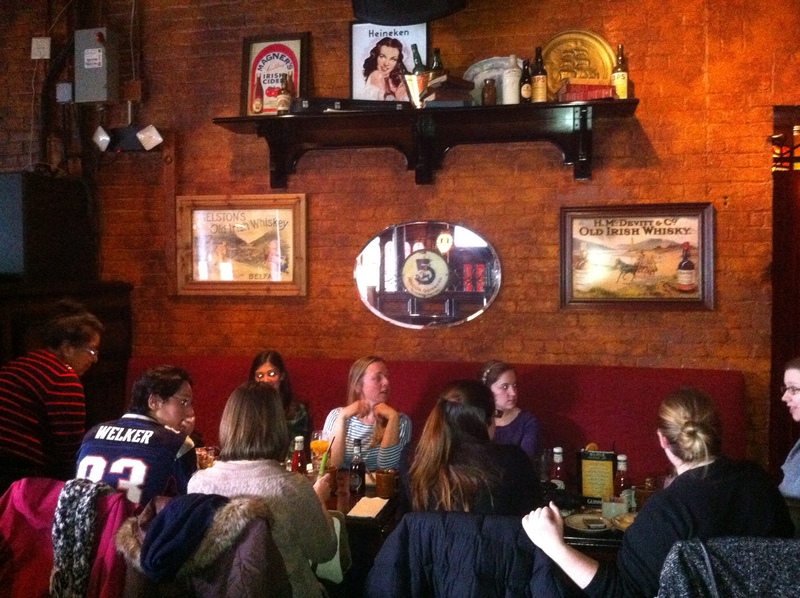 I joined my fellow bloggers at The Lansdowne a few Saturdays ago to get my Boston brunch-on. The Irish pub boasts a handsome interior, with its high ceilings, dark wood and color palate of deep reds. This is definitely a comfortable destination and spacious setting for watching a game. Our brunch group was a little smaller and therefore more intimate than the previous week’s Newburyport outing. We also had the pub to ourselves this morning (a nice bonus), so there was no need to shout across tables. 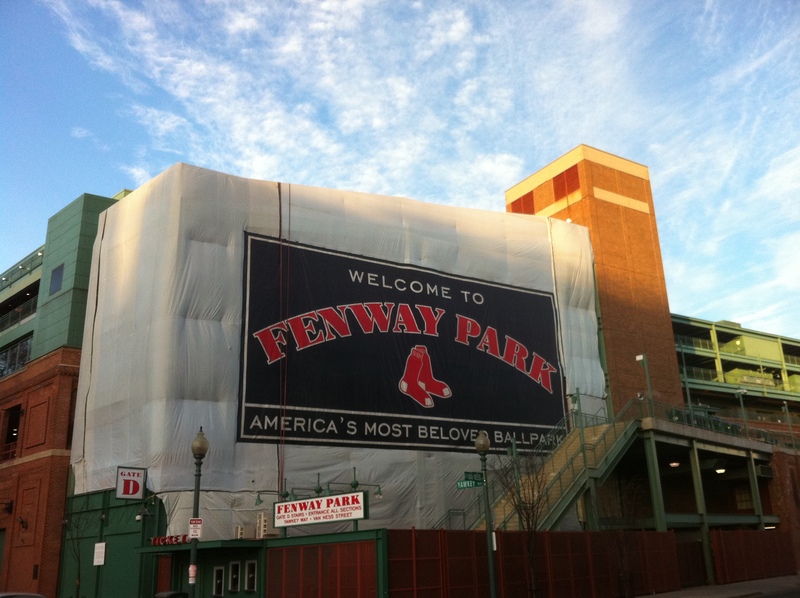 Besides its proximity to the mecca of Bostonian baseball fans (that may even be a redundant phrase as it seems almost impossible to find a Bostonian who wouldn’t give up his first born for the Sox), the Lansdowne has two other qualities that recommend it as a brunch destination. First, it showcases a formidable Irish Breakfast. If you are a fan of white & black pudding, beans & bangers for your first meal of the day, then this is the spot for you. 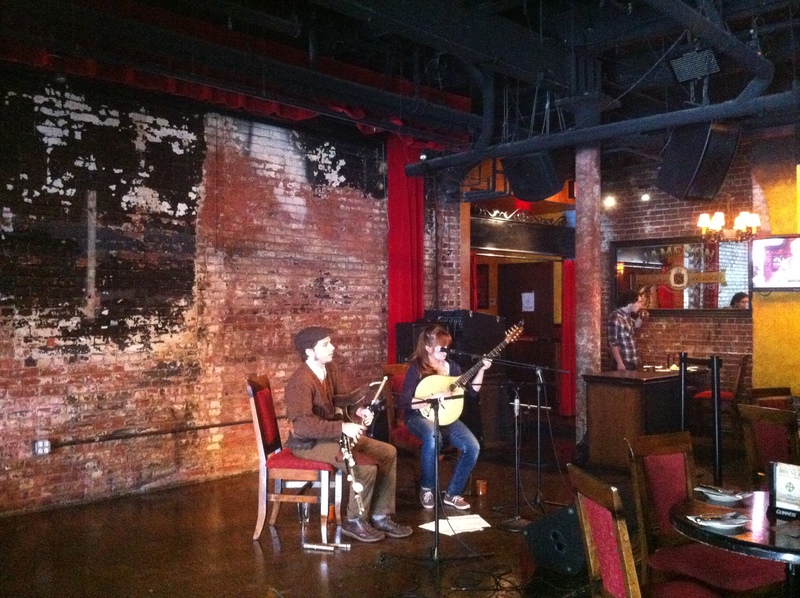 Second, Sundays offer you some live Irish music starting at 1pm (we heard the talented musicians practicing beforehand). For me, a traditional Irish breakfast is unfortunately not a draw. That is just way too much protein for my stomach in the morning. I have to say, I’m a confirmed carb gobbler when it comes to brunch, meaning that you are more apt to find me lifting forkfuls of French toast, pancakes, and Belgian waffles or spooning up oatmeal or yogurt and granola as my first meal of the day. 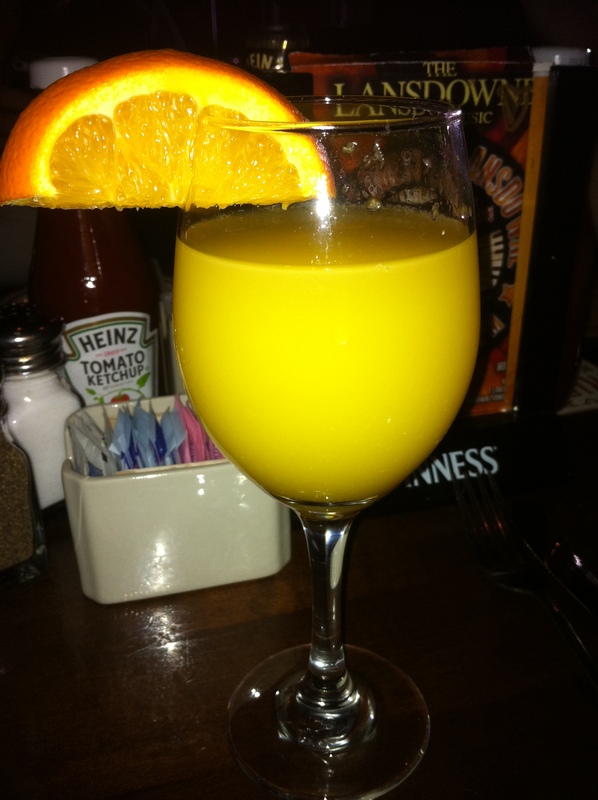 I started the meal off with a cheery and quite tasty mimosa (Ok, another less than Irish pick. I swear, I wasn’t going for a theme!) I noticed others also slurping their drinks appreciatively. And then it was time for the carbs of choice. 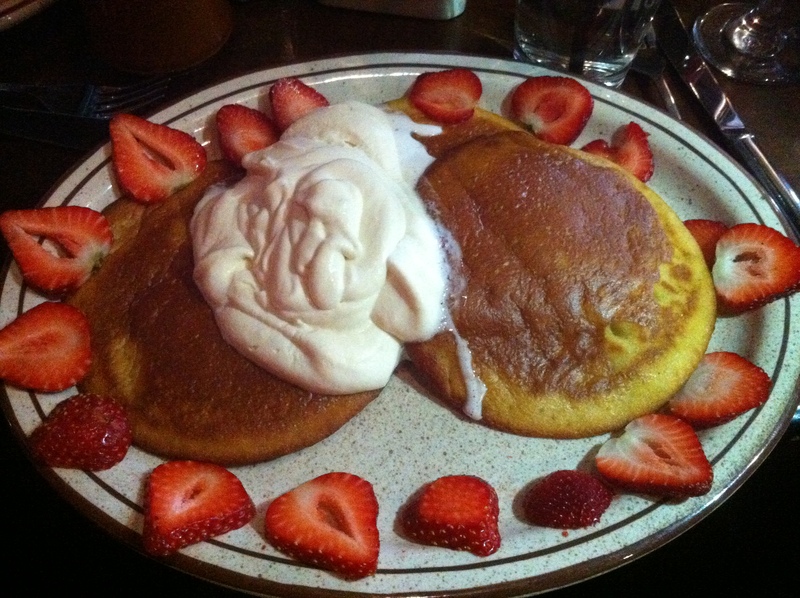 While my plate of pancakes came festively bedecked with sliced strawberries (matching the decor) and a more than generous dollop of whipped cream, I’ll be honest in saying that these were not the pancakes of my dreams. The garnishes were definitely the saving graces. The whipped cream appealed to the (alcoholic, pub-crawling) kid in me. But the pancakes themselves were forgettable–there was nothing to especially recommend them although they weren’t inedible (mind you, I was still a member of the clean plate club). My favorite brunch pancakes, at the now-shuttered Time Cafe in NYC, were everything pancakes should be (bursting with blueberries, or sliced bananas and nuts), generous, and pillowy with a nice tang from the buttermilk. So good that you didn’t need syrup or other window-dressing (or at least not too much of it). Sigh. Judging from the rapturous expression of the bruncher to my left, I might have done better had I ordered the eponymous breakfast pie. 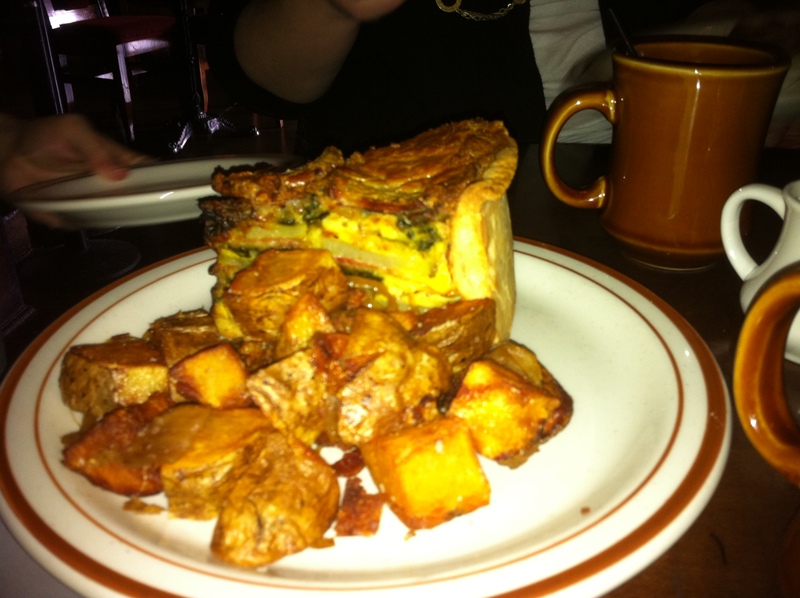 The Lansdowne pie is an early morning edible architectural feat composed of Irish Ham, eggs, potatoes, spinach ,onions and cheddar, served with a side of home fries. The Irish Breakfasters also hummed contentedly while eating their bangers and beans. While my pancakes may have left something to be desired, my company didn’t. And isn’t that what brunch is all about–good times with new and old friends? Disclaimer: The Lansdowne provided Boston Brunchers with gratis brunch. We only paid gratuity for the meal. Writing a review of the brunch was optional for all attendees. Good to hear you’re becoming more acclimated to Boston. It’s a great city!